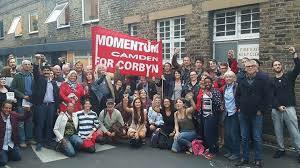 THE MILITANT BASE IN MOMENTUM LEARNS TO DEAL WITH THE ATTACKS OF THE LABOUR PARTY APPARATUS – The Posadists believe that the present crisis in Momentum is a crisis of growth. It is not one of disintegration. We reprint below the article entitled: “Momentum between the Devil and the Deep Blue Sea” (20.1.2017) which appeared in ‘The New Worker’ in Britain. This article contributes quite well to the understanding of the present situation in the Momentum movement. The Posadists agree that Mr Jon Lansman carried out a coup against the Momentum’s membership at the end of 2016, and now in Jan 2017. He did this by imposing on Momentum a Constitution that did not emanate from a properly conducted debate. By obliging all Momentum members to join the Labour Party, this Constitution places dedicated Corbyn supporters under the discipline of a Labour Party machine that supports Corbyn’s enemies; hence the enemies of Socialism. For example, the Compliance Unit of the Labour Party connives with the ‘anti-semitism’ smears of the Jewish Labour Movemement and Friends of Israel against the Labour left. The latter can conduct this internal war in the Party from their position as Labour Party affiliates. But why not try to have the Peoples Assembly as Labour affiliate instead, or the Greens? Or the ‘NHS Campaigns Together’? Led by Mr Ian McNicol of the Labour Party National Executive, the Labour Party’s Compliance Unit has withheld voting credentials from tens of thousands of Corbyn supporters. Some reports put the numbers involved at 120,000; but by not releasing the exact figure, the Party has acted as if its members do not need to know what happens to them in their Party life. Mr Lansman’s demand that all must join the Labour Party or leave Momentum – places the Momentum membership at the mercy of the Labour Party right-wing. Those who are made vulnerable here are not the right-wing, but the left. The ruling capitalist class wants nothing more keenly than the left militants (in the orbit of Labour) disciplined, in the hope that Jeremy Corbyn will get less support, people will give up hope, Socialism will get a bad name and Corbyn will not reach government. Now that this Constitution has been publicised and launched by Mr Lansman, there is every reason for the Labour Party Executive (NEC) to report to the whole country about this important change in its functions. And there is even more reason for the NEC to explain to the Party members and supporters what exactly it is arranging for them. For this has not been explained to them. In not having taken these steps by now, the Party has acted in expectation that the Party base has no business knowing what happens to it. Jeremy Corbyn excepted, many are the Labour leaders who behave like bosses; bosses who think that the Labour Party members need not view the Labour Party as their own. Behind Mr Lansman’s Constitution, the capitalist class hopes that the Labour leaders will eventually cause the Party’s militant base to give up the struggle for J Corbyn. Indeed, is there not a place in the House of Lords for the best renegades of Socialism, like Mr Neil Kinnock for instance? And isn’t the capitalist media constantly hunting for the ‘lefts’ whom it knows the Compliance Unit will wish to indict, in order to get rid of them? Isn’t that an alliance between the capitalist State apparatus and the Labour Party apparatus? Mr Lansman’s Constitution is not likely to prevail, in the end. It is not even in the interests of the Labour Party that it should. Because if the Labour Party is to survive in the face of capitalism’s nuclear and fascist preparations, it (the Labour Party) is going to need all its support, and more, and much more. Even the Labour parliamentary successes of recent times have started depending on mass Momentum mobilisations. The historic and terminal bankruptcy of the private-profit system is putting an end to ‘politics as usual’. The Posadists believe that the present crisis in Momentum is a crisis of growth. It is not one of disintegration. It is capitalism that disintegrates. In France for instance, the Socialist Party has to hold back its right wing – or be wiped out by its own right-wing (Macron/Valls) in direct alliance with the bourgeois class. In the same way, the Labour Party will lean on its hundreds of thousands of supporters – or the Tory right-wing and UKIP will rise up to sweep it out of the way. For the Labour Party, this fight is not one of disintegration. It is the expression of the class struggle in the Party. This needs discussing in the Party and in Momentum. 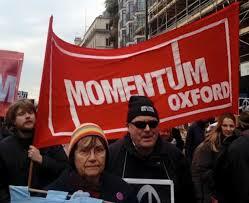 Momentum needs broadsheets and journals, internal bulletins, and mass meetings. The most scientific ideas must be allowed to develop within it, to prepare socialist teams and give confidence to the Corbyn leadership itself. At the time, groups all over the country — some inside the Labour Party and some not — were springing up and calling themselves Momentum as support for Corbyn swelled throughout the Left. It was a bit chaotic but with a single purpose — to back Corbyn’s leadership of the Labour Party and to rescue the party from the right-wing New Labour Blairites who still dominate its structure. 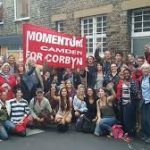 After Corbyn in 2016 succeeded in fighting off an attempt to force his resignation by Blairite MPs and a new challenge to his leadership, most Momentum leaders agreed it was time to give their movement some structure and a constitution and started planning a founding conference for early this year. Lansman, who until then had made up rules and structures ad hoc, has been using underhanded Blairite tactics to sabotage this conference or ensure it remains firmly under his control. He has tried to cancel national committee meetings and proposed that Momentum become an on-line organization with on-line debates and voting, and just individual members and no group structures — one member, one vote. It is exactly the sort of structure Tony Blair was aiming for in the 1990s when he opened up membership to anyone applying to the party head office without reference to local constituency parties. Such members had no local contacts, they had no power to influence policy, and their numbers rose and fell according to how the party was being perceived in the mass media. The Momentum national committee nevertheless set about organizing a foundation conference on the basis of delegates from local groups. But Lansman, earlier this month, staged a coup by presenting a new constitution and declaring that the conference would consist of debating workshops with no voting on the organization’s structure. He claims this will protect Momentum from Trotskyist infiltration and accuses all who oppose his dictatorial views or support the principles of democratic centralism of being Trotskyists. Lansman’s constitution demands that all Momentum members must be Labour Party members with a deadline of 1st July to join. This will exclude those victims of the Israeli embassy-inspired witch-hunt that accused a number of Corbyn supporters of anti-Semitism. The Israeli embassy involvement in this was exposed last week by the Qatari Arab news agency Al Jazeera and included video footage of Israeli diplomat Shai Masot boasting about “taking down” MPs who support human rights for Palestinians. This includes Jeremy Corbyn, and the attempt to smear him and some of his supporters as being anti-Semitic was part of the ruling class attack on Corbyn. 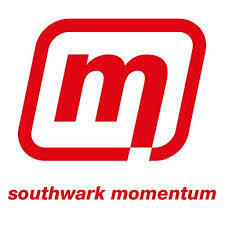 Momentum members around the country — including Lansman’s own group in Southwark — have rejected his attempt to impose this new constitution. But some of them, including Fire Brigades Union (FBU) leader Matt Wrack, are countering by calling for a new “democratic socialist current” within the Labour Party based on a narrow Trotskyist platform that excludes all Marxist-Leninists. Once again the working class movement is being caught in a trap between underhanded and anti-democratic right-wing Labour machinations and an ultra-left false antithesis. This is not the “new way of doing politics” that Corbyn said he was trying to build — and it will not attract the broad masses who have stood up to support Corbyn because he stands against austerity, against injustice and against war. It will drive genuine left-wing activists and trade unionists to despair, and there is a real danger that they will quit the movement. But the turmoil inside Momentum is also a measure of how hard at work the ruling class agents in the Left have been to sabotage Corbyn and the values he stands for. It would be a tragedy for the Left to allow people like Lansman to drive out genuine activists. It would help if Corbyn himself would take a stand but he holds back fearing what the press will make of it. And he has allowed Lansman to persuade him to appease the agents making false accusations of anti-Semitism at the expense of good comrades. We knew the ruling class would pull out all the stops to sink Corbyn and try to make it impossible for him to become Prime Minister. It is up to us communists to present a clear picture of what is happening and call on all Left activists to stay together, organize and fight on, and to be aware that achieving real social justice will take a lot more than a general election — it will take a socialist revolution. The Compliance Unit is an organ of the Labour Party Executive (NEC). It disciplined arbitrarily tens of thousands of Labour Party members and supporters under accusations of ‘misconduct’ and ‘anti-semitism’; what this helped was not mass education in the Party, but tens of thousands of Labour supporters being prevented from voting Corbyn. The French Socialist Party now allows Benoit Hamond (whom it tried v. hard to marginalise) to stand as presidential candidate. This is because the votes for Hamond will weaken the position of Jean-Luck Melanchon (now no longer in the Socialist Party) who commands wide support in the country.